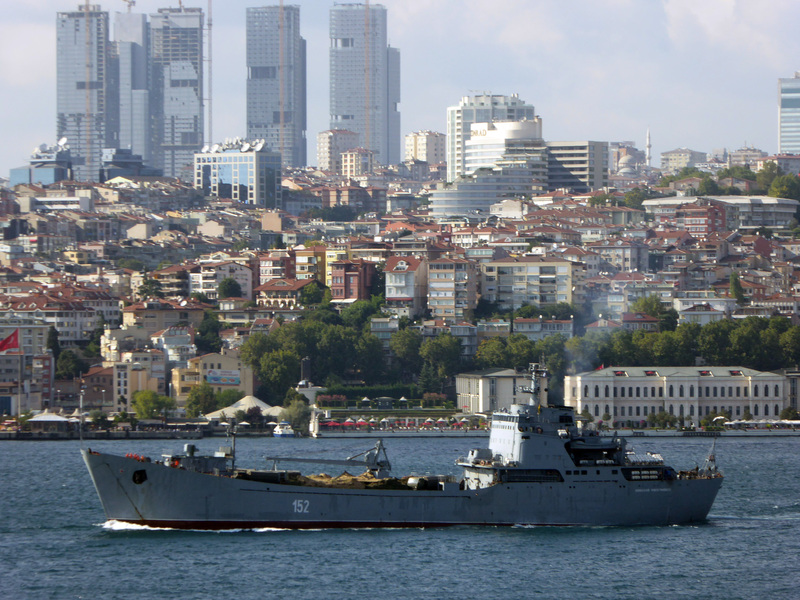 Alligator class landing Russian ship Nikolay Filchenkov making a south bound passage through Istanbul. Her destination is not known to us. Photo: Shonquis Moreno. Used with permission. The cargo on deck. Photo: Shonquis Moreno. Used with permission. On August 20, 2015 Alligator class landing the ship Nikolay Filchenkov made ​​one of her passages through Istanbul. The event was not worth of remembering if there was no cargo on deck of the ship. There are at least 4 KamAZ-4350 (4×4 or 6×6 either but definitely not 8×8) and one GAZ-66 trucks plus 2 or 3 things under tarpaulin. Of course those things hidden under the tarpaulin arouse the suspension most. Their height is less compared to the trucks suggesting that they could be a launcher. In that case this could be one of two batteries of some kind. Any additional information or suggestions are welcomed. To Thanks Yörük Işık and Arda Mevlütoğlu for helping me identifying the trucks and correcting my mistake in identifying the ship. Not miss the Do update on this topic! Pingback: SANSANI | Just how far is Russia bolstering Assad? Pingback: The Times расслышала русскую речь на поле боя в Сирии - Грузоперевозки по всему миру. Таможенное оформление, импорт и экспорт, аутсорсинг ВЭД.